Brendan Leonard lives in a van. Even though Brendan has never left the United States, the brave native Iowan has climbed most of the big peaks in the Western United States, including those at the Rockies, Yosemite, Grand Tetons, Canyonlands, Sawtooths, and elsewhere, and has written about his adventures for Climbing, Backpacker, Men’s Journal, Adventure Journal, Dirtbag Diaries, and Outside. 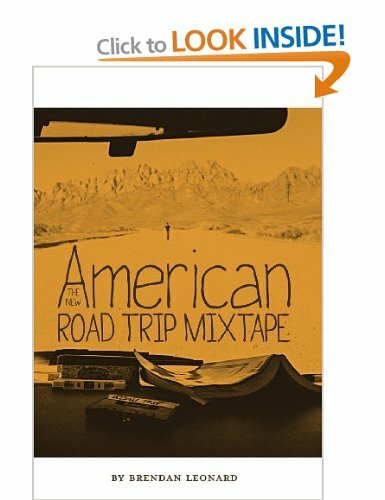 Still, Brendan’s new book The New American Road Trip Mixtape , apparently pretty much self-published, comes out as a slightly vanilla, vaguely cornball, barista-hip cliché—an earnest soul-searching “Eat, Pray, Love” for young men—following the car tracks and drawing upon obvious quotes from Jack Kerouac’s On the Road and John Steinbeck’s Travels with Charlie, as well as Andy Warhol, Robert Pirsig, Willie Nelson, Pearl Jam, and the Allmans. And, of course, as in most American road trips, there is the unscheduled stop to see Hemingway’s grave in Ketchum, Idaho. The catalyst for this thirty-something bumming around in the West like an unemployed PHISH fan comes with the ending of his doomed marriage and breakup with his longtime girlfriend, Tess. However, though Brendan alludes to it often and even reaches over in his sleep, he can’t quite mask the self-congratulatory pain. Nor can we really feel it at first. Except for a moment when a waitress in a diner fantasy strikes him as the most beautiful woman he has ever seen. But Brendan is generally close-mouthed about the possibility of romance on the road, for him. However, Brendan is a good writer, or rather, raconteur, and his physical descriptions of weather changes in the peaks and detailed road directions seem lifted straight out of a diary upon which he writes on his steering wheel in the present while we are reading over his shoulder. Even though Brandon has very few possessions left (besides rappelling ropes and ice axes and camping gear), all in a storage space in his last adopted home in Denver, we can’t help but really feel for him having to give up, like so many of us, his furniture and plates to his exes. But not his 600 CDs and mixtapes, which make a cinematic soundtrack to his brave new adventures, sleeping in the back of a beat-up wagon, becoming a connoisseur of convenience stores (cashews, potato chips, candy bars)—and hopefully, taking the occasional shower. He also manages to disappoint with non-events like meeting fair-weather friends in Las Vegas and the Grand Canyon, although he does make the grueling hike into the Evil Knieval crevasse, rather than just take a quick look-see like Chevy Chase in Vacation. Brendan Leonard lives in a van.